Happy 2016 from the HoneyFitz Events team! We decided to kick-off our blogging with a short-and-sweet recap of our big launch year! 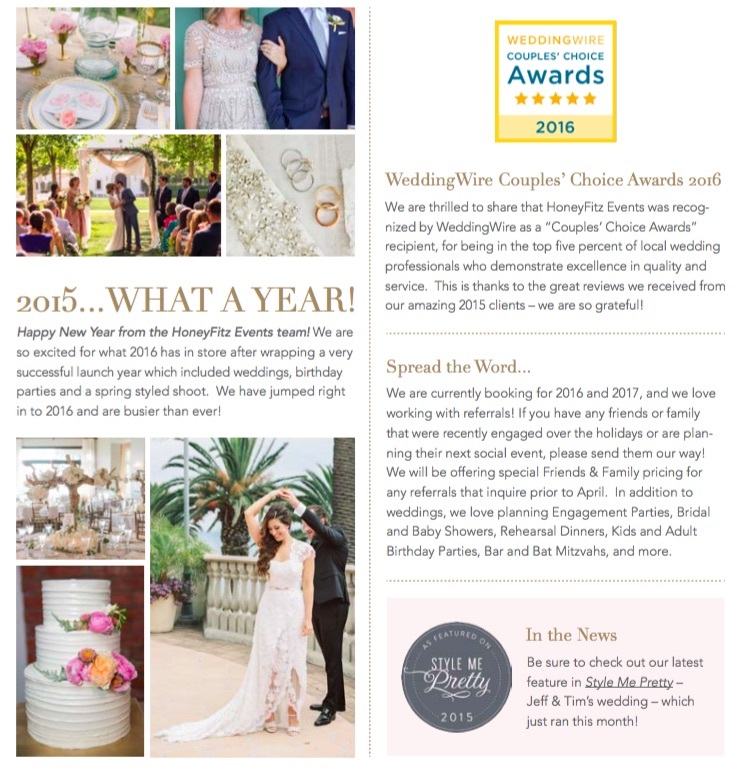 We are also excited to highlight a couple of successes that we achieved last January including an award from WeddingWire and a feature in Style Me Pretty! We can’t wait to see what the rest of the year brings our way and we look forward to sharing with you! 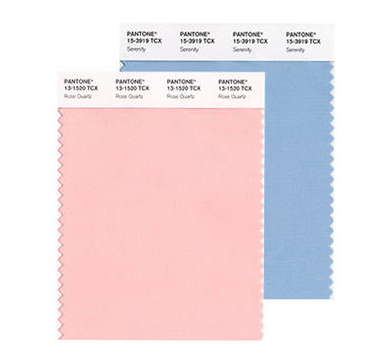 We are super excited about the announcement of the 2016 Pantone Color because there are not one but two amazing colors! 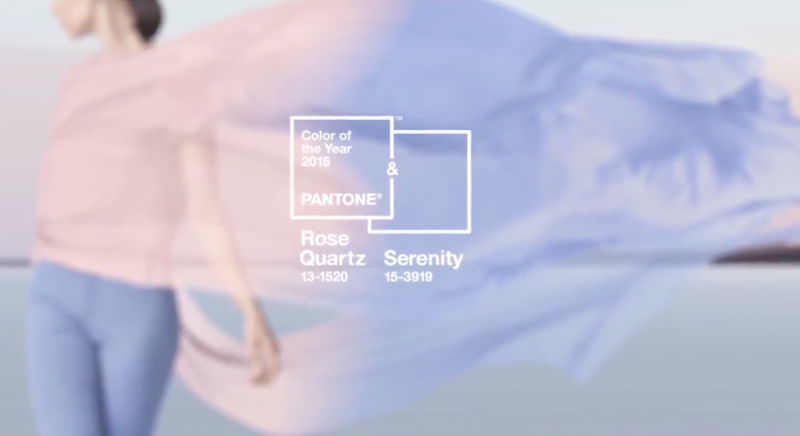 The colors that have been selected for the year are Rose Quartz and ​Serenity. They are both gorgeous colors individually and make a beautiful combination when paired. – If you have not yet selected your wedding colors, you could easily pair these two dreamy colors for color pallete​ inspiration! 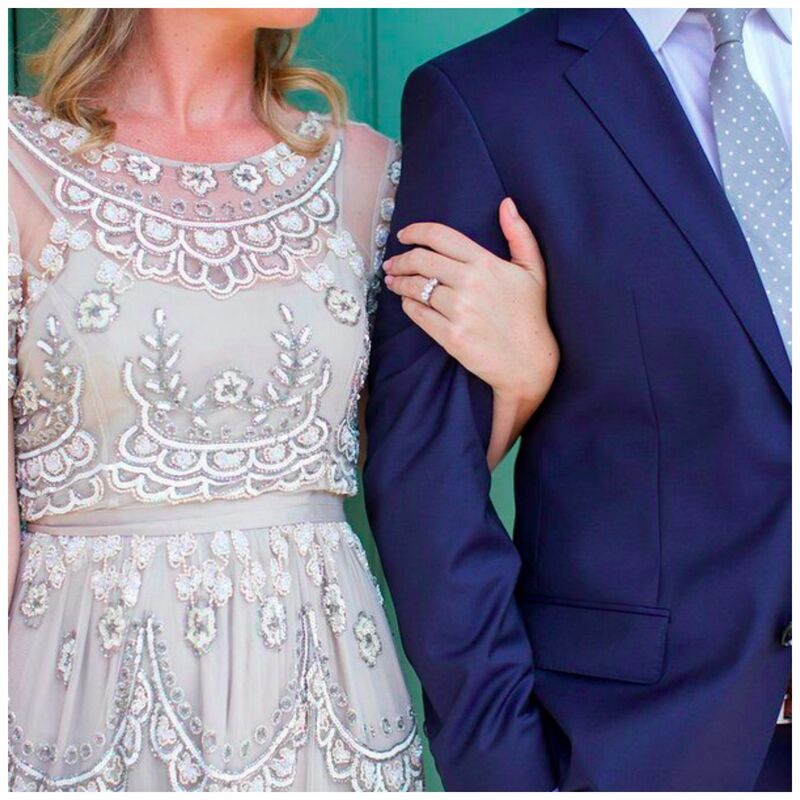 They are refreshing and will be a great way to ensure your wedding is on trend for 2016. 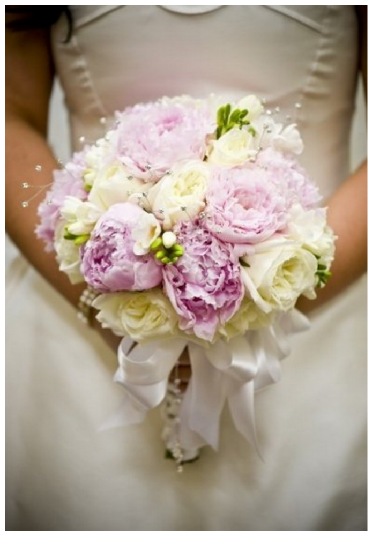 – If you have already selected your wedding colors, you could always look to incorporate these beauties into your flowers. These colors could bring the perfect accent into a white on white color pallete​ or something a bit more neutral. 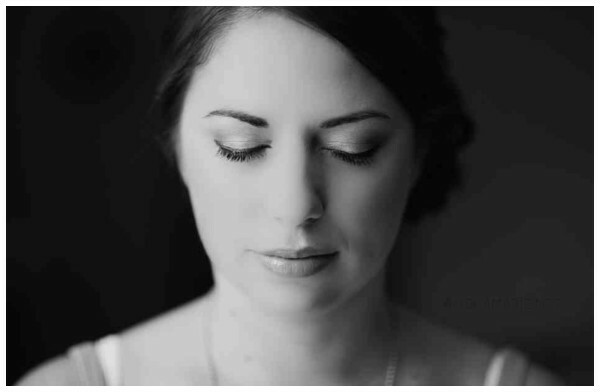 – Bridesmaids dresses can be a tricky topic. If you are letting your bridesmaids select their own styles, there are sure to be lots of Rose Quartz and​ Serenity threads flooding the market place. If you have not yet selected a direction for dresses and they can nicely weave in with your color pallete,​ this could be a natural direction to head with bridesmaids dresses. – If you have already selected your color pallete ​and are dying to work these colors into your scheme, you could use them for invitation inspiration. Since your invitations are sent in advance they do not necessarily have to be on theme with the rest of your day. You could do something really different and fun blending the two colors together and working them into your invitations. There are so many ways that you these amazing inspirational colors can be incorporated into your big day and we only touched on a few! Most importantly, your best result will always come when you get creative and make sure that it is a reflection of yourself! We are excited to ring in 2016 with Rose Quartz and​ Serenity! Thanksgiving is only three weeks away and the festive season has begun! Over the past week, you’ve probably started to buy Hanukkah and Christmas presents, you may have been invited to a couple of holiday parties and you are stressing about the cocktail soiree you are throwing (or at least I am). ​My husband and I throw a holiday party every year — it’s become a special tradition for our family and friends. Even though I look forward to hosting this every December, it always a very busy and I have to plan ahead. 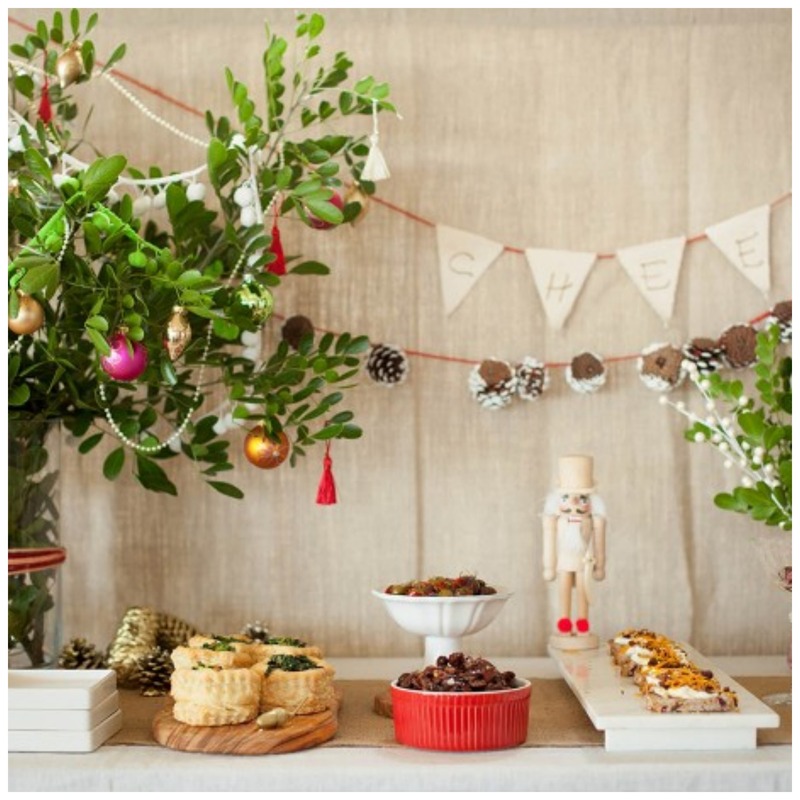 ​This has inspired me to share some holiday party preparation tips that have helped me tremendously over the years. It’s highly probably that you are competing with one or more holiday parties on the same day as yours. Make sure you get your invitations out at least one month in advance at the latest. You might want to even share the date in advance or send a save-the-date to the guests you know that you really want there because you can never be too early when it comes to the holiday season! Determine what type of party you want to have and what you want to serve. And make it easy! In the past, I’ve done different formats from buffet style and tray-passed, to caterers and solely desserts. In terms of beverages, I’ve offered a full bar, only served wine and hired bartender. But self-serve is the easiest — I’m actually thinking of going this route this year. 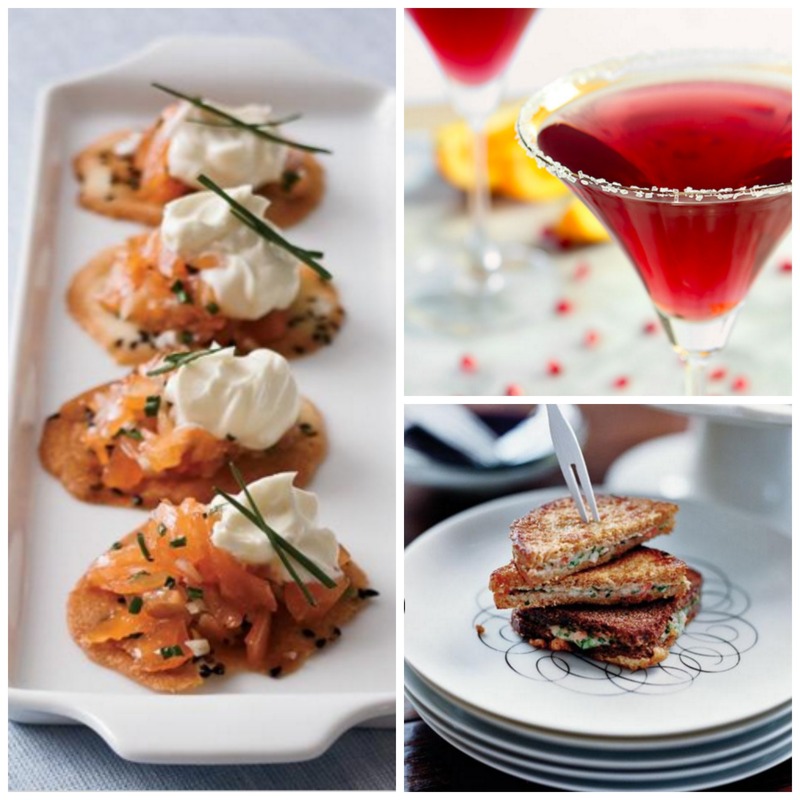 If you are offering appetizers, select ones that you can make them ahead of time. You can even freeze some and pop them in the oven on the day of. Also, what’s really key is to make a list of the everything that needs to be made and in what order. And try to have everything prepped for stuff you can’t make beforehand. Make sure to have your holiday decor up at least a week before​. I always try to do any table decor or tablescapes the night before. Low florals and decor tend to work best with food displays. One of the best tips that I learned from my Aunt Franny is to plan what you are serving in each dish or platter and label your dishes on the table in advance. That way you won’t forget what you are serving in each one. Be organized so that you can relax and enjoy your party! You’ve definitely heard this before… A bride must wear, “something old, something new, something borrowed, and something blue,” on her wedding day for good luck. It’s one of the most well-known traditions which comes from an old English rhyme dating back to 1898. The rhyme also adds that a bride should also have a sixpence in [her] shoe, but that’s not widely known or practiced in the U.S., since sixpence isn’t American currency. 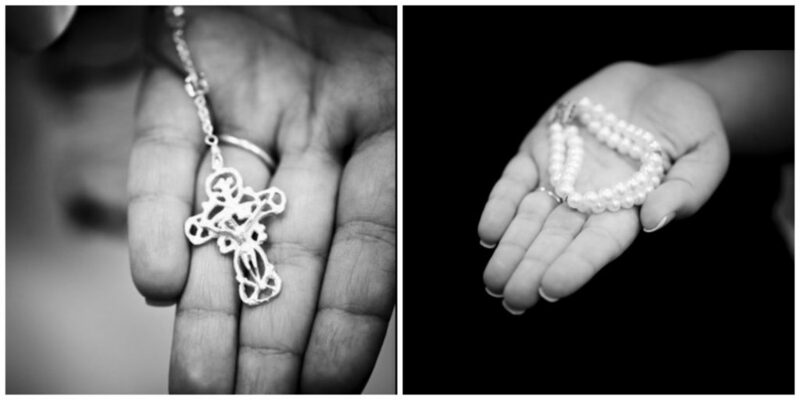 ​Today, most brides incorporate these for items as part of their wedding attire or carry them on their big day as good luck charms. Get the tissues out, a lot of brides incorporate an item that belonged to a deceased family member like a piece of jewelry, a handkerchief, etc. I have a friend who doesn’t wear much jewelry, so she had her grandmother’s brooch sewn into her wedding gown. I wore my grandmother’s rosary wrapped around the base of my bouquet. This is probably the easiest item to come up with for most, because a lot of brides wear a new gown on their wedding day. I did! But if you are borrowing a dress or wearing one that was passed down to you, you could wear new accessories like earrings or a necklace. If you are already borrowing a dress or veil from your mother or grandmother as your “something old,” your “something borrowed” could be a nice way to integrate the family you are marring into the tradition. For instance, I borrowed my mother-in-law’s pearl bracelet and my sister-in-law borrowed my veil. There are some really cute options for your “something blue” — lingerie, a garter, or shoes (especially if you are a Carrie Bradshaw fan!). My “something blue” was my initial embroidered in blue inside my gown. It was a thoughtful touch from Carolina Herrera — apparently a little surprise she does for all of her brides. 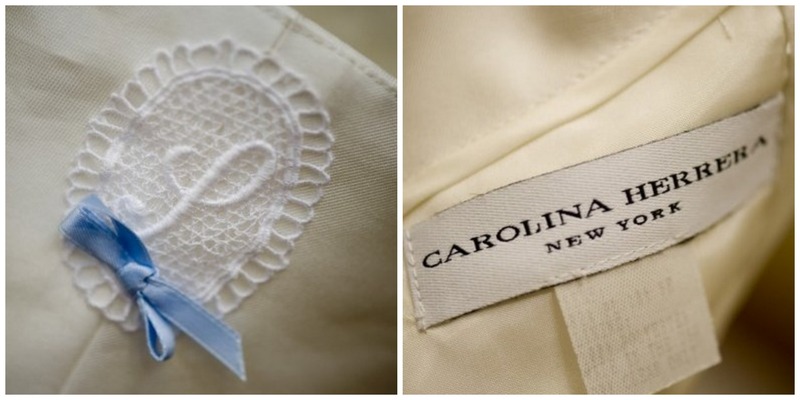 You can order something very similar from JCREW, which makes a small label in grosgrain ribbon with your initials and wedding date embroidered in blue, that can be affixed inside your dress. This also makes a really sweet bridal shower gift — always a hit with the bride! You can find a sixpence on Etsy, eBay or at a coin collector shop. I had one in my shoe (which was given to me as a gift) and it’s still in there today! Not matter what you decide on, have fun coming up with these items! If you are a bridesmaid, maid-of-honor or mother-of-the-bride, these little tokens can make a special gift to the bride-to-be! 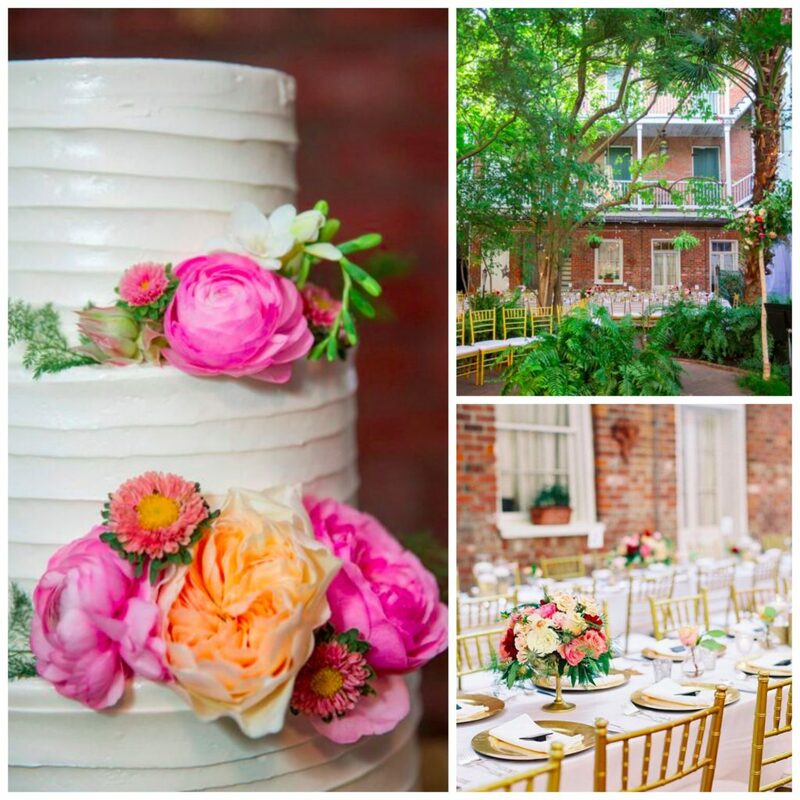 New Orleans is a city filled with charm and heritage, Gracie and David couldn’t have picked a better location for their wedding celebration! 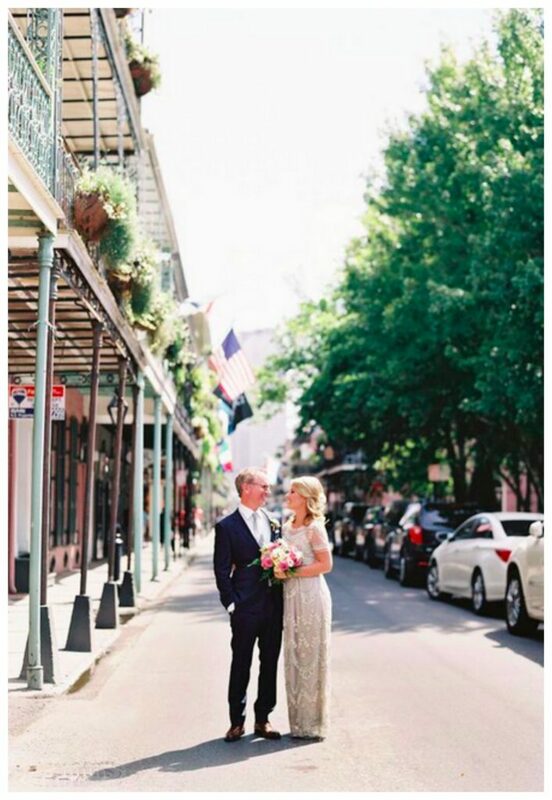 Both Los Angeles residents, the bride and groom knew that they had to have their destination wedding in New Orleans, because Gracie has felt an emotional connection to the city ever since she was a student at Tulane University. 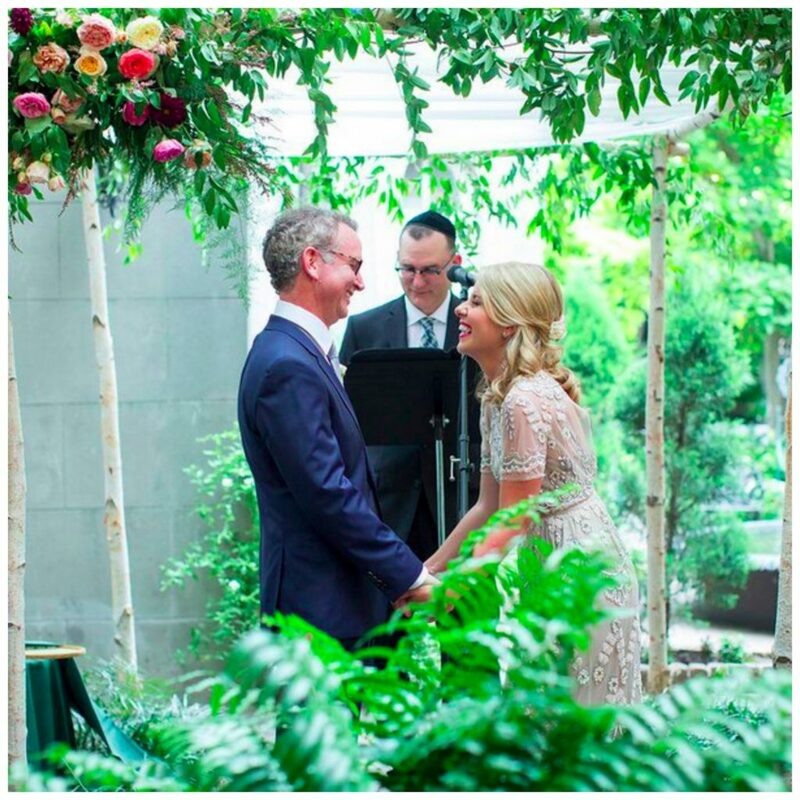 Their ceremony incorporated a lot of laughter which is important to Gracie and David as they are both comedy writers. Surrounded by close friends and family, their intimate evening included an artist who painted a scenic portrait during the reception and a fabulous brass band that led the entire party through the city’s streets for the Second Line, a tradition unique to New Orleans. 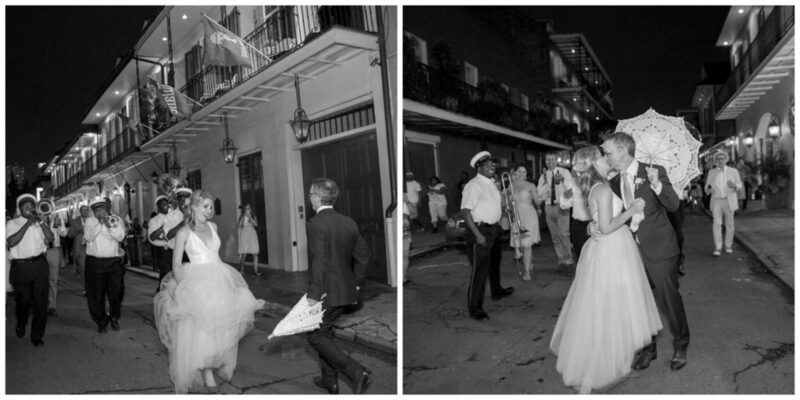 Gracie and David’s wedding was also very special to us because it was our first time in New Orleans! 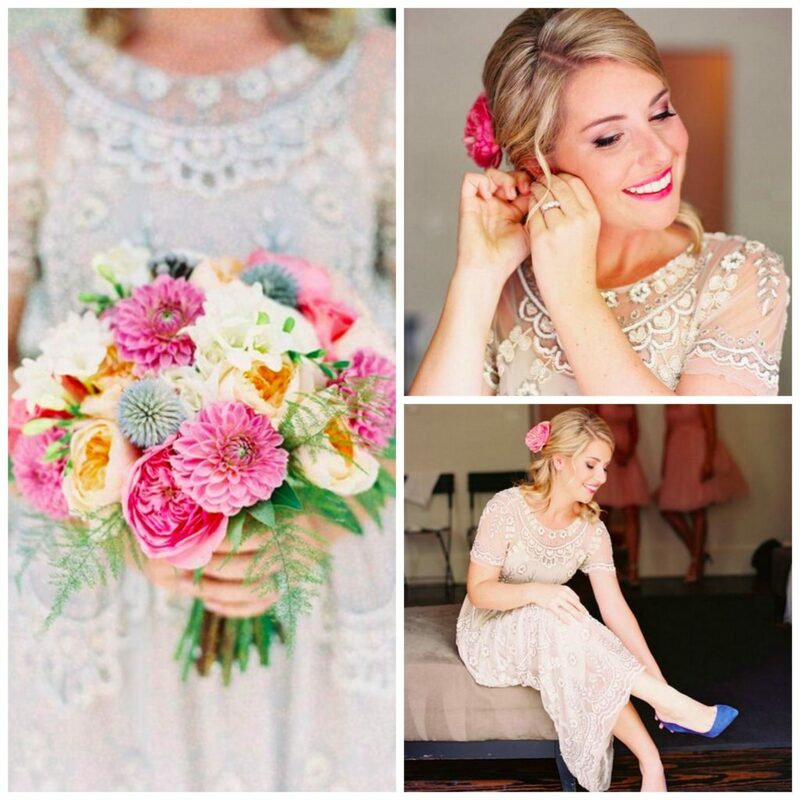 It was so easy to pour our hearts into this wedding, because the bride is one of my husband’s best friends and we wanted to make sure her day was magical. We absolutely love the photos from their wedding and are so thrilled to share them! In the simplest of terms, a Ketubah is a Jewish marriage contract and was traditionally a legally binding agreement. Today, it remains an active part of the tradition of many Jewish weddings and is seen as a spiritual document. 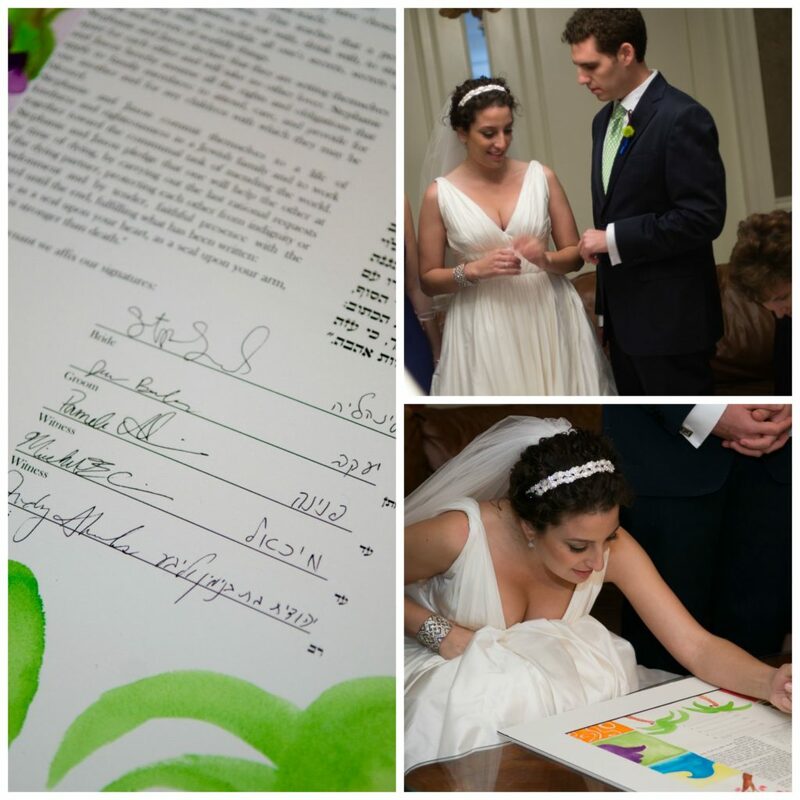 Below, I break down the basics, along with a few tips to think about when incorporating a ketubah signing ceremony into your special day. Some couples choose to use the standard, traditional text, while others may take a more modern approach. One of the most popular modern versions, and the one my husband and I chose, was written by Rachel Adler – a professor at Hebrew Union College-Jewish Institute of Religion – and is completely egalitarian and relevant to life in this century. 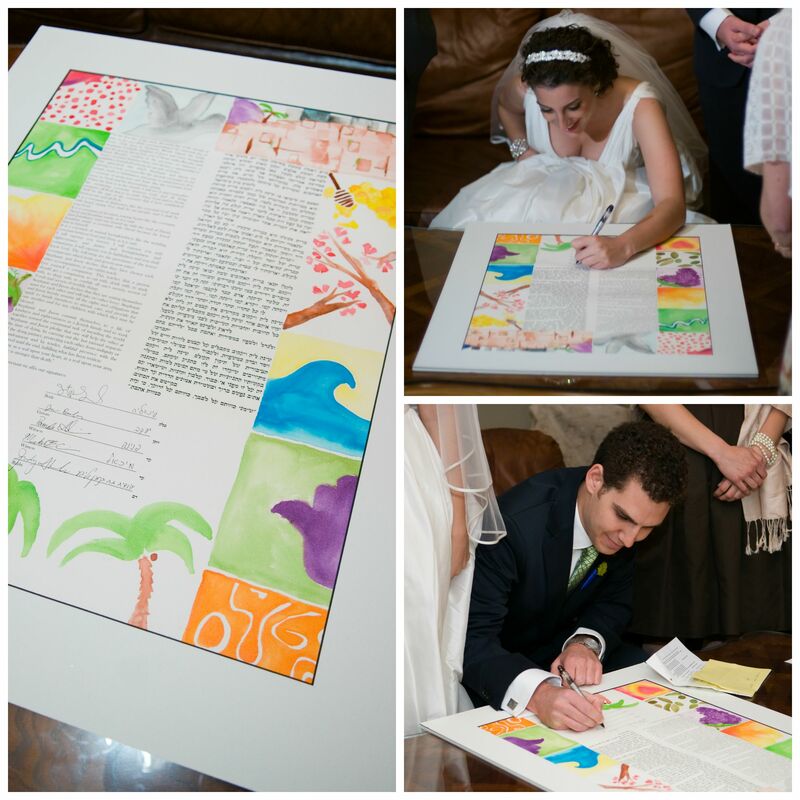 At artketubah.com, you can find a listing of the many options available. It is also, of course, an option to write your own text or incorporate your own personalized marriage vows into the text. The sky is really the limit. As if there aren’t enough decisions to make when planning a wedding! In my opinion, the visual aspect of your ketubah really is one worth spending the time and energy on as it will last well beyond your wedding day, and will probably hang as a piece of art (and a reminder of your marriage vows) in your home. There are so many different routes to go with this one. The simplest option is to hit up a few different websites, pick your favorite, convince your future partner that this is their favorite as well, and order away! Take a look at artketubah.com, ketubah.com, shopketubah.com, and most Judaica websites for thousands of options. You can get papercuts, watercolors, nature themed, abstract, traditional; basically whatever your taste is, you will be able to find a number of ketubahs to choose from. Etsy is also another great option for a personalized ketubah and along the same lines, if you have an artistic family member or friend, ask them to work with you to design the ketubah of your dreams. I’ve even seen them designed by graphic artists to match wedding invitations and décor. I was excited to have an artistic project for my wedding that didn’t require tying any bows, so I painted my own. The beauty is there are no real requirements in regards to the art, so whatever makes you happy is perfect! When & Where: Most couples hold the ketubah signing ceremony about 30 minutes prior to the wedding ceremony directly following the first look (if you plan to have one). Any small room with a desk or table will do. 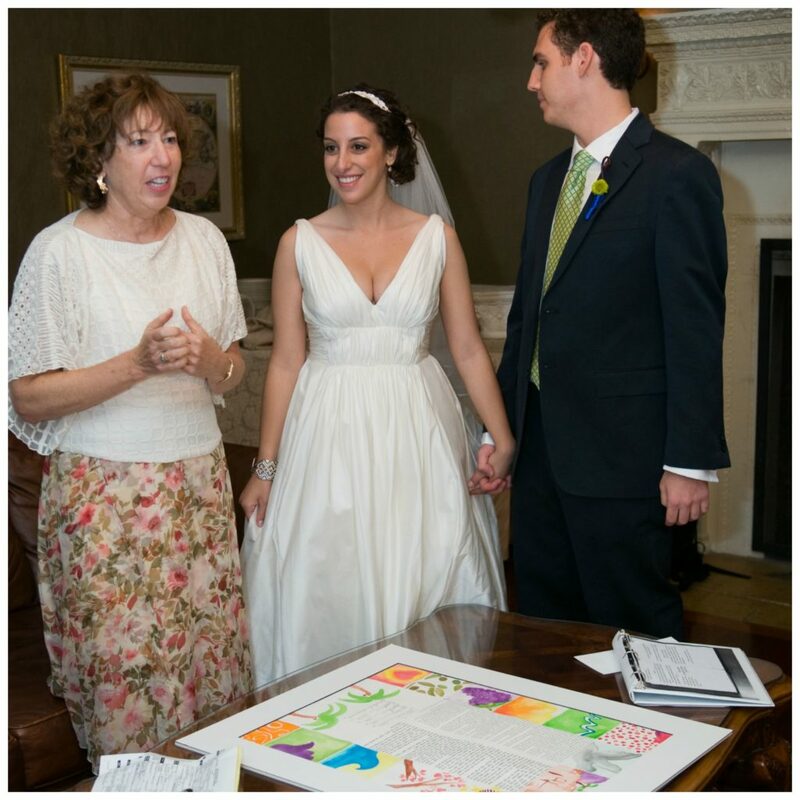 Who: Usually, the ketubah requires two witnesses, along with the Rabbi or officiant. This is a great way to provide two additional honors. I’ve had friends who had no wedding parties honor their closest friends this way, or in our case, our opposite gender best friends were our witnesses. Others have close aunts, uncles, cousins, etc. serve as their witnesses. 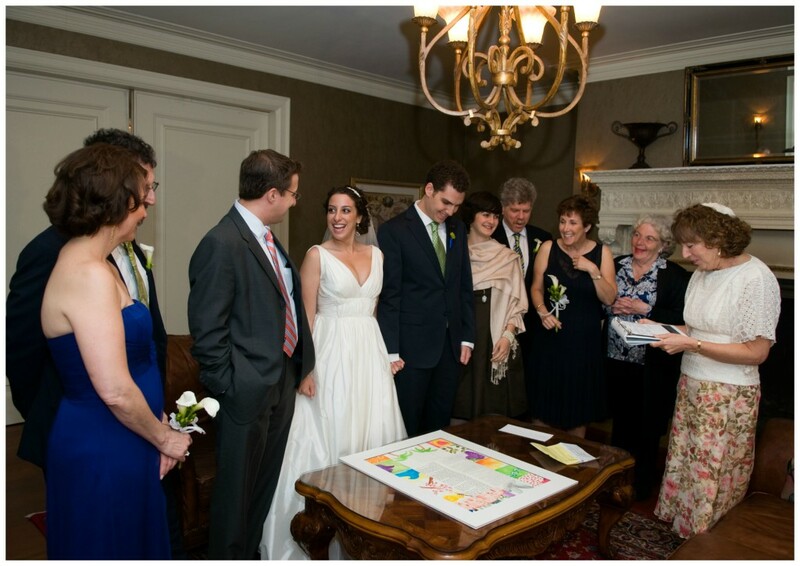 Most people have just their wedding party and immediate families at the signing and then have the officiant do a quick recap/pointout the ketubah during the ceremony. Framing/Display: Since you spent all this energy picking out the perfect ketubah you will probably want to display it during your cocktail hour/ reception. The best way to do this is to have the ketubah matted at a framer before the wedding and also have the frame ready to go so after you sign it you can place it in the frame, on an easel, or at least place the matted piece in plastic, lest your marriage document start its life covered in your tipsy bridesmaid’s Pinot or your flower girl’s Shirley Temple. So there you have it, Ketubah 101! In closing, I just urge you not to make it an afterthought, and enjoy creating a contract together that serves as a lasting memento of the beginning of your life together! Stephanie Bressler is a fundraising and events specialist, with a background in the Jewish nonprofit world. She has a degree in Near Eastern Judaic Studies, and a Master of Jewish Communal Service and Communication Management. She loved planning her own wedding in Newport, RI, although has even more fun planning her sons’ birthday parties. It’s been a very busy summer for us and today marks the end of the season! 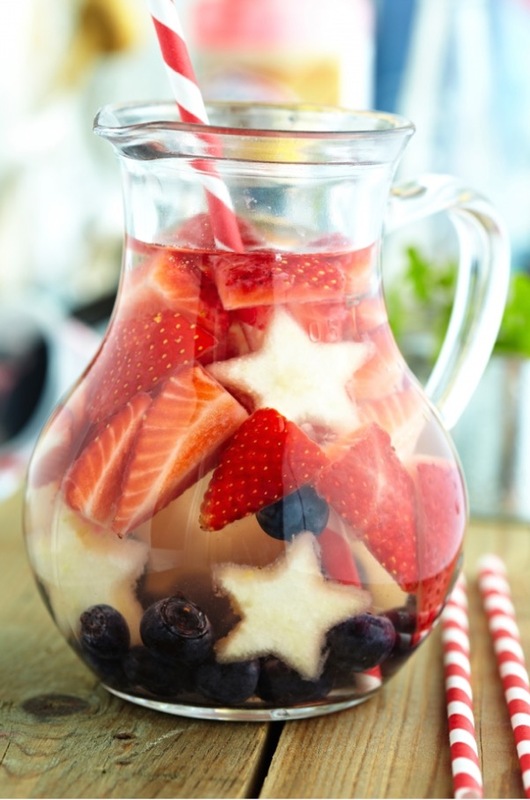 We are enjoying the day with a refreshing and simple “End of Summer Sangria” by celebrity caterer Andrea Correale. Enjoy!!! 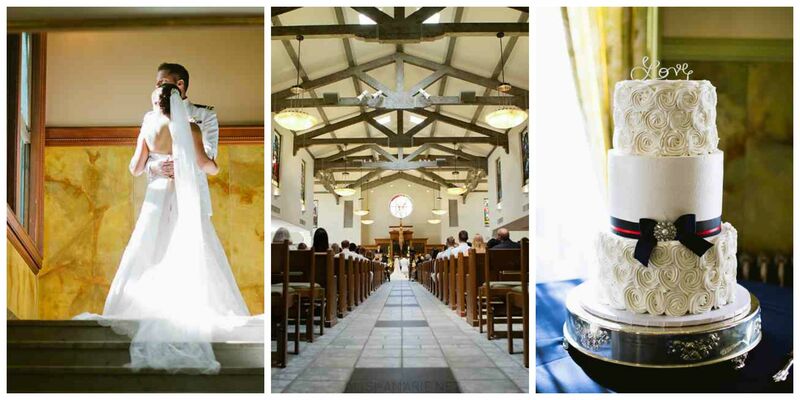 We are back at it again for Wedding Wednesday and excited to share our amazing Fourth of July Wedding! 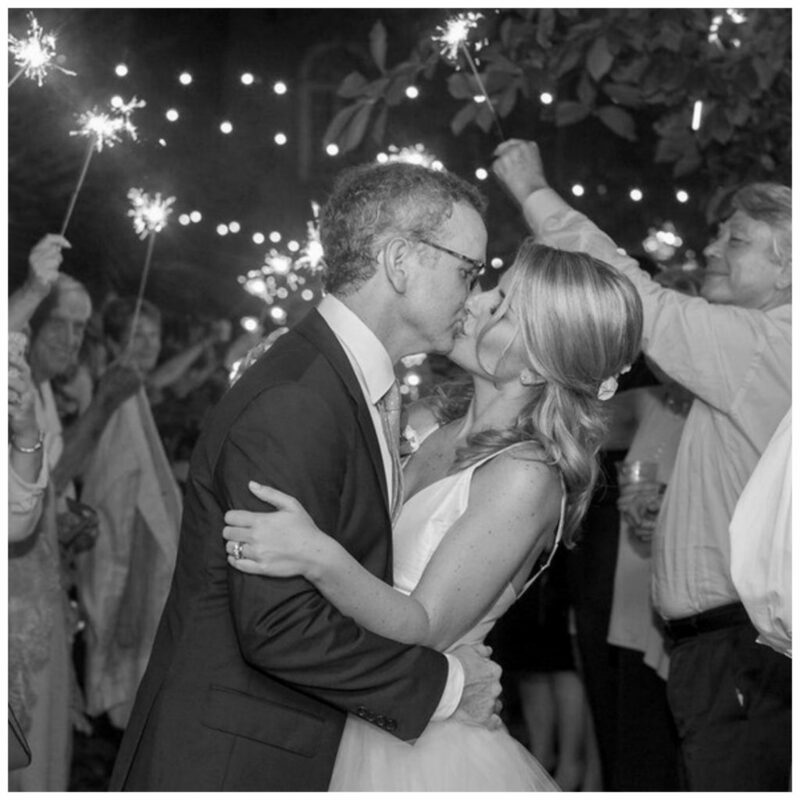 We loved Tara and Brian’s wedding for so many reasons, but especially because they are just so adorable together! The lovely bride and handsome groom grew up a few towns away from each other and it was so fun watching their two families come together on their special day. 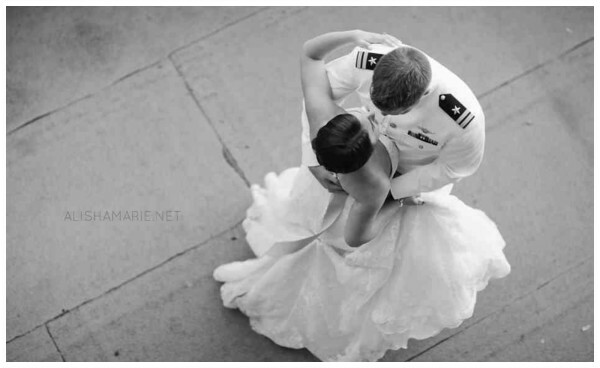 The groom was in the Navy which made the evening’s Fourth of July theme extra special. The gents all looked distinguished in their Navy uniforms and there were patriotic touches throughout the day. It was lovely to spend the holiday celebrating Tara and Brian! Virgin Honey Mint Lemonade Cooler — Recipe! Today is National Lemonade Day, so we wanted to share one of our favorite lemonade recipes from Lilly Pulitzer’s The Juice Stand! It contains our favorite ingredient — HONEY!!! 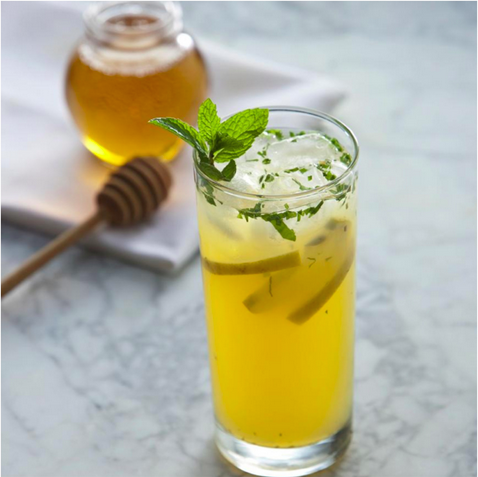 Before summer ends, make a Honey Mint Lemonade Cooler! 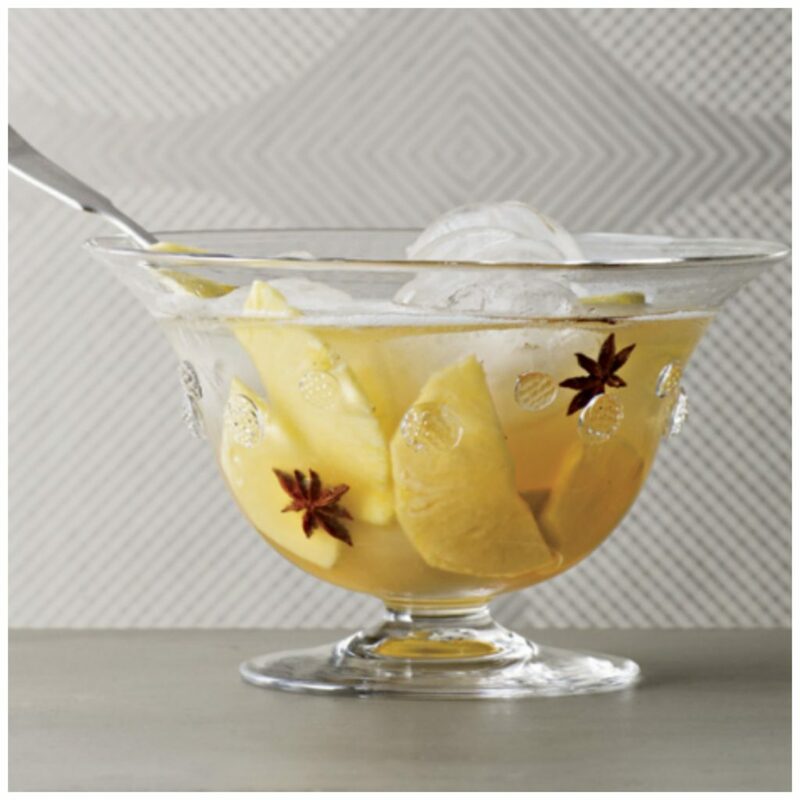 This refreshing combination of flavors is perfect for a hot summer day! Friends and family had a blast celebrating Ellana and Jeffrey’s wedding. 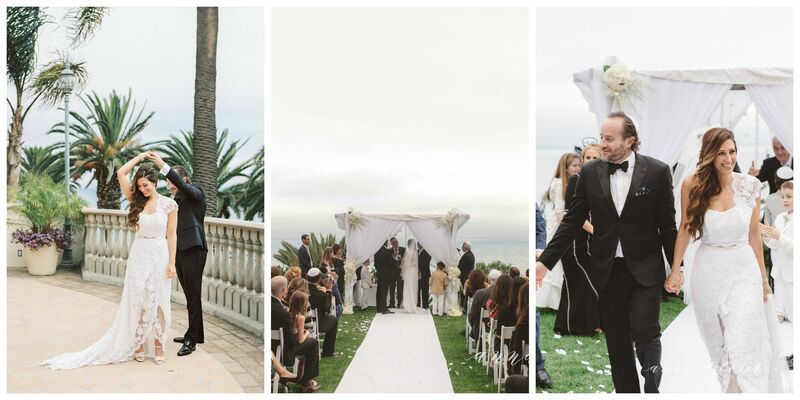 This wonderful couple combined their Jewish and Persian traditions and said “I do” overlooking the ocean. Taking place off the California coastline at The Bel-Air Bay Club, their white-on-white evening was romantic and candle-lit. Their cool color palate was accented by the natural feel of light woods and succulents. Guests mingled over sushi, cod and decadent fruit and dessert bars. Everybody hit the dance floor and partied to live Latin, Israeli and Persian music. 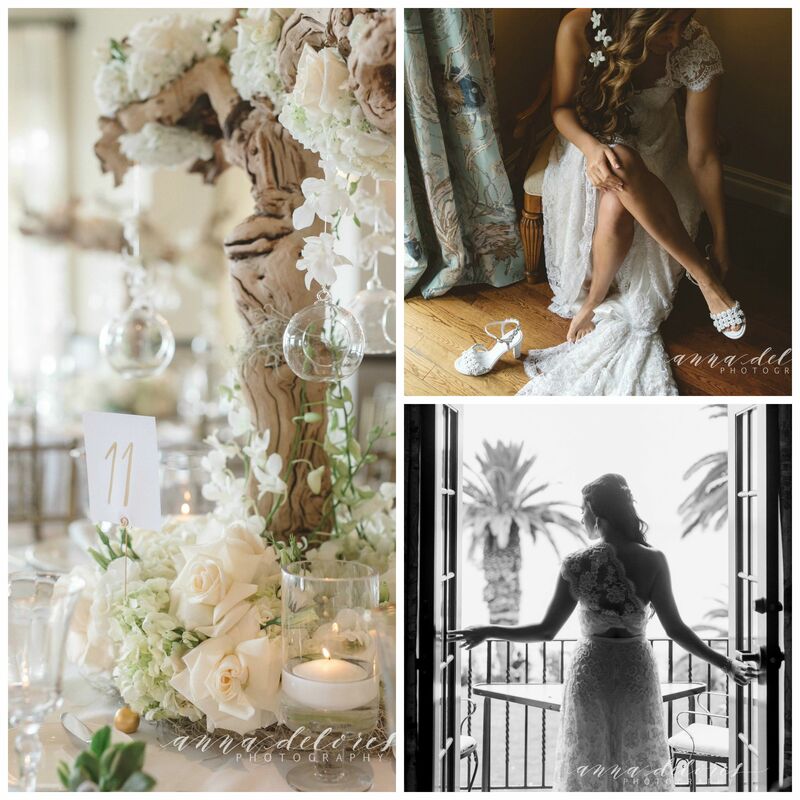 Full service event designers and planners based in Los Angeles, primarily Southern California, but always ready to travel! We coordinate, style, and produce Weddings and Vow Renewals; social parties including Showers, Bar/Bat Mitzvahs and Children’s Birthdays; and Corporate Events.